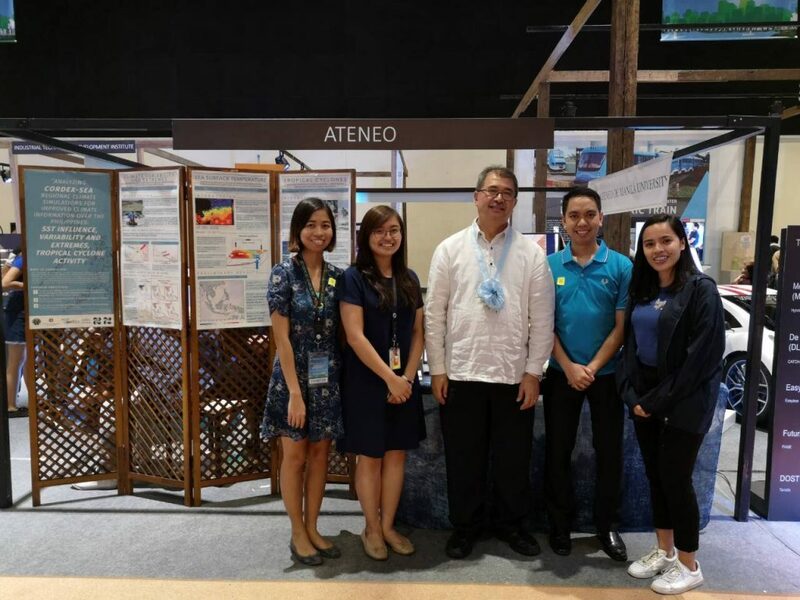 Through the Physics Department of the School of Science and Engineering of the Ateneo de Manila University (ADMU), the Regional Climate Systems (RCS) Laboratory of the Manila Observatory participated in the exhibit of NSTW. Researchers Bryron Leaño, Jennifer Tibay, Shane Visaga, Erica Bañares, and Angela Magnaye represented RCS. Through this participation, RCS presented the work that they do in their laboratory, the CORDEX-SEA project with DOST-PCIEERD was a highlight in the exhibit. The team was also able to promote the MS Atmospheric Science program of ADMU. RCS Research Assistants (L-R) Shane Visaga, Angela Magnaye, Byron Leaño, and Erica Bañares with DOST Secretary Fortunato dela Peña (center) at the ADMU Booth in NSTW. RCS engaged the public by encouraging them to participate in a guessing game about the number of typhoons that passed through the Philippine Area of Responsibility and made land fall over a specific historical period.